Compact, decontaminable, durable and adaptable, this litter is designed for rescuers that require level “A” protection. Whether you’re in the Hot Zone or evacuating after a major incident, the HMH Sked dramatically increases efficiency. It can be dragged over virtually any terrain including stairways and can be rapidly deployed by one person. Made of medium-density polyethylene plastic, the HMH Sked withstands high temperatures and is unbreakable as low as 120 degrees Fahrenheit below zero. This litter is designed for use in mass casualty incidents where terrorists using Weapons of Mass destruction, mass casualty evacuation from hospital or other building or any other Haz-Mat incident requiring level A protection occur. The HMH Sked is extremely versatile. It can be dragged over virtually any terrain including stairways. 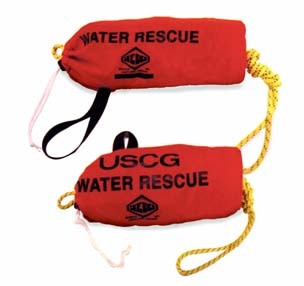 It requires less effort from rescuers wearing level A protection. Patients can be rolled or dragged onto the HMH Sked rather than lifting. This creates less rescuer fatigue and allows many more victims to be saved. 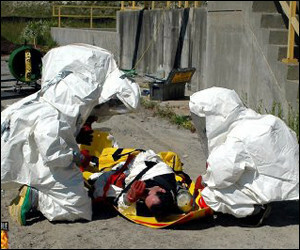 A downed rescuer can be roll loaded by using his air tank for leverage and evacuated before the standby rescuers can zip up and be duct taped. This allows his rescue without committing the standby team. A rope is attached to the tow strap of the HMH Sked for towing out of the Hot Zone by rescuers at decon, which allows saving energy and precious air of the level A rescuer. This results in many more victims being saved. HMH Skeds can be stored and shipped on pallets of up to 200 per pallet. Pallets can be stacked 3 high for prolonged storage in a space of 8 ft x 3 ft x 7 ft high. Bagged strap sets store in moisture resistant boxes on top of the stack. Picture below shows 78 HMH Skeds in an eight inch height. Pallets can be sling loaded under helicopters or loaded onto light trucks for transport to the incident. Two people, one on each side of pallet can attach the straps. HMH Skeds are assembled in 1-2 minutes each. This is faster than they can be used. 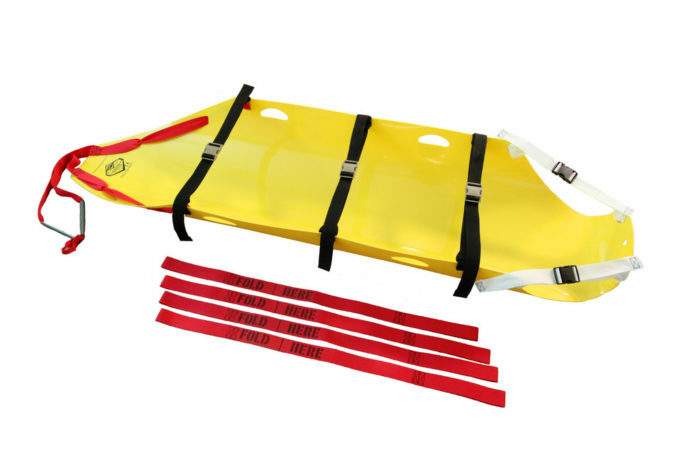 HMH Skeds can be rolled 1-4 per bundle for easy storage in compartments of rescue or fire apparatus. This allows for rapid use by units first on the scene. 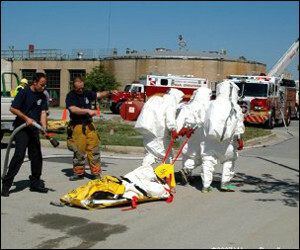 Emergency responses to Hazardous Materials incidents are not just dangerous. They are very complex, personnel, rich, and the equipment is very expensive. These factors greatly limit the numbers of non-ambulatory patients that can be removed from a contaminated zone. The introduction of the HMH Sked and newly developed tactics, even though in their infancy, have greater capabilities in fulfilling the rescue mission. These include, at the very least, the ability to rapidly (a word not often used in Haz-Mat operations) remove large numbers of patients and minimize the risk to rescuers. By using these creative new techniques and others being developed, the potential of this device is only limited by the creativity and expertise of the trainers and field personnel.With Haz-Mat incidents on the rise in this country and the potential for terrorist activities which can result in mass casualty situations, the HMH Sked is a tool that allows response personnel to efficiently and above all, SAFELY rescue substantially more of the victims. 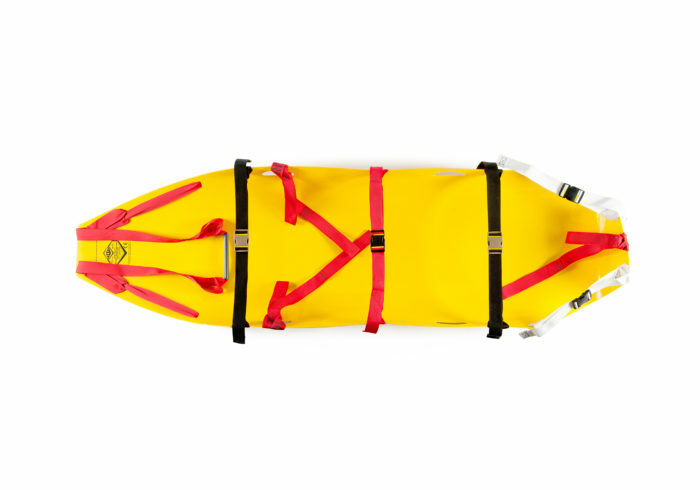 Drag handle at the head end for patient safety – with two plastic grips for use by two rescuers. Four cut-in plastic handles eliminate webbing and ensure a secure, safe lift. Flexible, medium-density polyethylene plastic – unbreakable at 120 degrees below zero. Does not absorb chemicals, making it easily decontaminable. Will fit on decon-conveyors for easy decontaminating, and handling of patients and litter. 8 ft. x 36 in. and only 11 lbs – easy to handle by rescuers wearing level “A” protection. 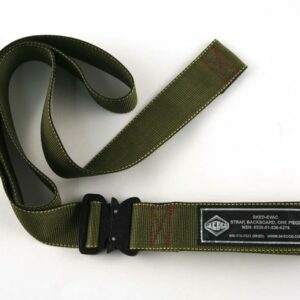 Military-grade, 2 in. 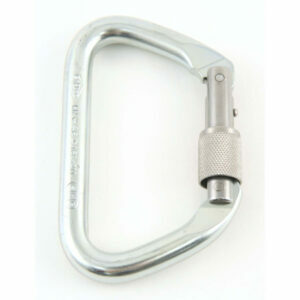 side release plastic buckles are non-corrosive, won’t spark, and inexpensive to replace in the event of contamination. 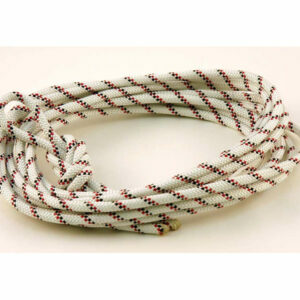 Polypropylene slings can be attached to drag HMH Skeds up and down stairways. 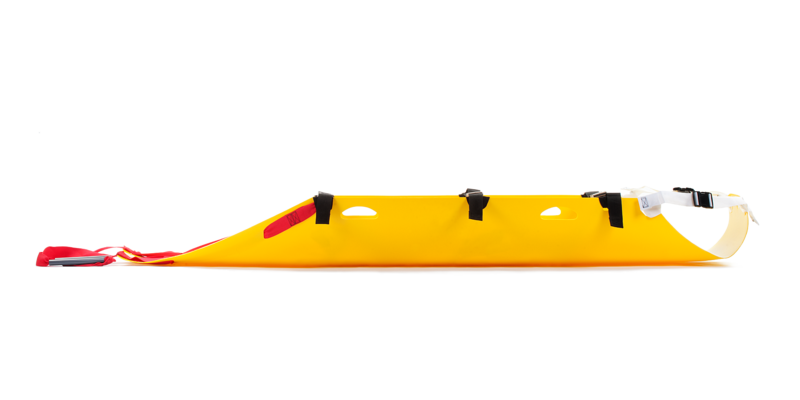 When equipped with the Skyhook WMD Patient Evacuation System (SK-2520), as many as four rescuers in level “A” protection are able to work in the Hot Zone on a major incident.